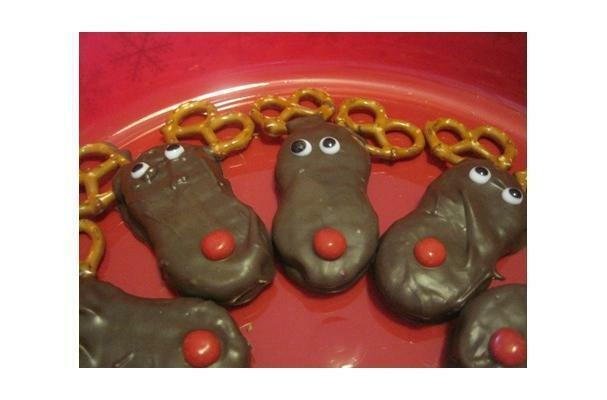 These chocolate Nutter Butter reindeer cookies are sure to get Santa to visit on Christmas Eve. They are a simple treat that are totally delicious. This recipe recommends using chocolate almond bark for the coating of the cookies but your favorite milk or dark chocolate will also do. If you are a fan of white chocolate, this same technique can be applied to making Nutter Butter snowmen. Dip Nutter Butter cookies in the bark; coat fully. Place cookies on waxed paper. While still wet, place red hots (if you are using those) on your reindeer, and then the pretzels… I dripped extra bark around the part of the pretzel that is being attached to the cookie so that they are more likely to stay on well. Once it dries, it works like a charm. Just be gentle with the little guys until it is time to consume them… the ears will break if dropped! How does one form the reindeer head when the cookies are square?